High traffic and heavy use may scratch your marble, chip your travertine, damage your slate, dirty your tile and grout, or dull your concrete, but replacing your floors is most likely not necessary. TECHSTONE can restore your natural stone, tile and grout, terrazzo, or concrete floors to their like-new condition. From homes, apartments, and condos to offices, warehouses, retail stores, restaurants, hotels, and more, we provide expert interior and exterior floor restoration services, for residential, hospitality and retail, and commercial and industrial properties. Trust your floors to the professionals at TECHSTONE. We guarantee dramatic results. Check out our Gallery and Video Gallery to learn more about our amazing work. We provide expert services for marble, granite, travertine and saturnia, slate, and many other types of natural stone floors. Our professional deep cleaning services are no match for regular cleaning or janitorial services. Scratches aren’t a problem for us. Consider etching gone. We make holes and lippage (uneven tiles) disappear, reducing the likelihood of trip-and-fall accidents. We can eliminate damage along the surface, remove most stains, hone and polish, and then apply a sealer to inhibit staining and make regular cleaning easier. For certain types of stone, color enhancing sealers can bring out the color and natural beauty of your stone. If you want a glossy, glass-like shine to your floors but currently have a matte/honed finish—or vice versa—we can change any finish. You are probably already aware that any flooring subject to high-traffic can quickly lose its appeal and become dull, scratched, and dirty-looking. Terrazzo is no exception. If your terrazzo was hidden under carpet or some other surface, it is likely damaged with holes from carpet tacks or nails, deep scratches, ugly stains, unsightly cracks and chips, and other damage. Don’t cover your terrazzo again. Let us get our hands on it. Improper restoration methods use waxes and coatings that only last a short while, and ultimately end up doing more harm than good when they become scratched and scuffed, and dirt, grime, and other contaminants become embedded. To keep the floor from being ugly and unsanitary, the coatings have to be completely removed and replaced as often as every three months. Sometime the coatings are not completely removed, and with each passing strip-and-wax, the floor gets a new layer of yuck. TECHSTONE repairs chips, cracks, and holes in terrazzo. We grind and hone away the scuffed and scratched surface layer to reveal the brand new stone underneath, and then polishe your terrazzo to a beautiful shine, providing the finish of your choice — a velvety smooth satin/matte finish or a glossy, elegant polished finish. To help inhibit stains, we can also apply an impregnating sealer. With our terrazzo restoration and maintenance services, expect incredible results. 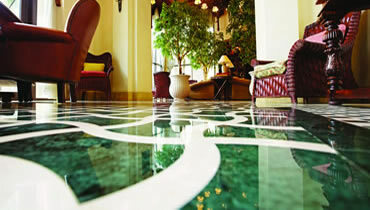 We provide expert services for porcelain, ceramic, mexican tile, and other types of tile and grout floors. Our professional deep cleaning services are no match for regular cleaning or janitorial services. TECHSTONE can remove deeply imbedded soiling and resolve a host of tile and grout cleaning problems, leaving your floors as pristine as the day they were installed. Whether you need minor services like having your tile floor deep cleaned and grout lines clear sealed or major services like tile replacement, grout replacement, or grout color sealing, we provide a full range of tile and grout floor care and maintenance services. Imagine a smooth, durable concrete floor, free of pits, scratches, and stains, that has a beautiful, natural sheen. We can achieve this for you — without using topical coatings or waxes. Concrete is porous. That means it is full of tiny holes that become filled with dirt, grime, bacteria, allergens, and other contaminants. TECHSTONE’s concrete cleaning and sealing services are dramatically effective. We can deep clean and sanitize your concrete or we can acid wash your concrete, giving it some texture to help prevent trip-and-fall accidents. With either method, it is important to follow up with an application of concrete sealer. Our concrete sealing services enhance the appearance of your concrete floors and protect against stains. For concrete floors marked with unsightly damage, TECHSTONE offers expert concrete repair services. We can use tinted filler that matches your concrete to fill in chips and cracks, and the hone or polish to smooth and blend with the surrounding finish. In addition, TECHSTONE provides concrete restoration services — or should we say, performs minor miracles with concrete. We can hone away the scuffed and scratched surface layer to reveal the brand new stone underneath, and then polish your concrete to a beautiful shine, providing the finish of your choice — a velvety smooth satin/matte finish or a glossy, elegant polished finish. Regular cleaning and janitorial services are valuable for simple, day-to-day care of natural stone, tile and grout, terrazzo, or concrete floors. But over time, their processes leave floors with grout lines that just won’t come clean, shiny scratches, increasingly obvious traffic patterns, and other unsightly features. As these problems develop, you become more and more dissatisfied with the appearance of the floors until it’s time for another round of professional restoration. With our regularly scheduled maintenance program, your floors can look great all the time, without the need for periodic restoration. For a free estimate on tile and grout cleaning and sealing, marble, other natural stone and terrazzo or concrete honing, polishing, sealing, repair, restoration, and professional maintenance services for floors in homes and residential, commercial or hospitality properties use our online contact form or call (888) 570-2859 today.